The complex herbal flavors of shiso (reminiscent of mint, lemon, anise, basil and curiously cinnamon) complement the sweet buttery taste of wild-caught Atlantic sea scallops. Miso aioli adds creamy, garlicky, umami characteristics. A refreshing crisp carrot cucumber slaw balances all those rich notes. 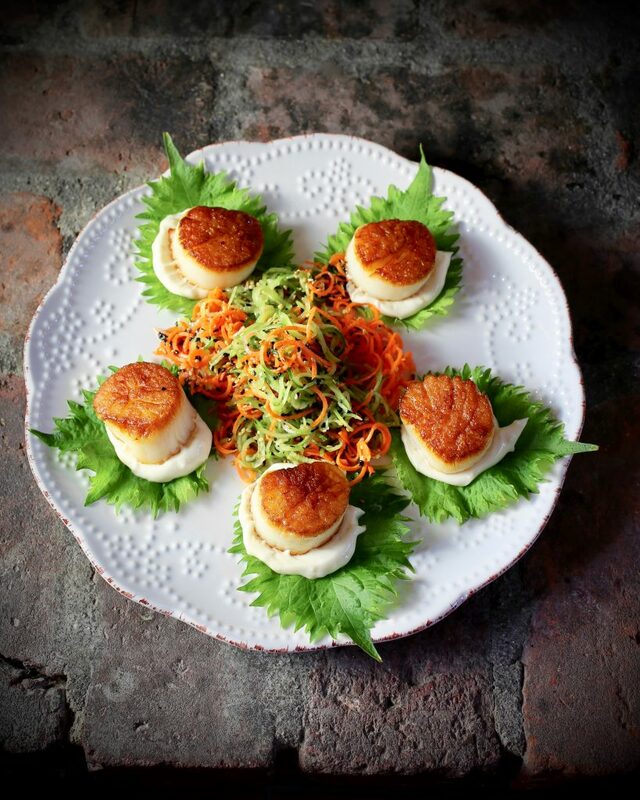 At the last minute, place a spoonful of slaw on top of each scallop, then serve one scallop per person for a palate-pleasing amuse-bouche. Big flavors, bold colors, eclectic textures create a stunning small bite to launch your next elegant dinner party. In a ramekin, thin the miso paste with a small amount of hot water. Place egg in the small bowl of a food processor. Stream in canola oil, then olive oil. Turn off the machine then add garlic and miso. Process briefly to combine all the ingredients. Marinate the carrot in a splash of rice vinegar to soften. When ready to serve, combine carrot with cucumber. Add a splash of sesame oil. Season with salt and garnish with sesame seeds. Choose dry pack, wild caught Atlantic sea scallops that have a sweet, rich buttery taste. These scallops contain no preservatives or additives and do not ooze liquid during the cooking process, unlike wet scallops that have been soaked in a phosphate solution. Heat a non-stick sauté pan over high heat. Add canola oil to coat the entire bottom of the pan. When the oil is very hot but not smoking, place the cold dry scallops in the pan. Be sure not to crowd the scallops. Cook over high heat for approximately two minutes to form a nice caramelized crust. Flip the scallops over with a pair of tongs and a fish spatula, and cook the other side. Get ready to serve immediately. Place a dollop of miso aioli on each shiso leaf. Place a scallop on top of the aioli. 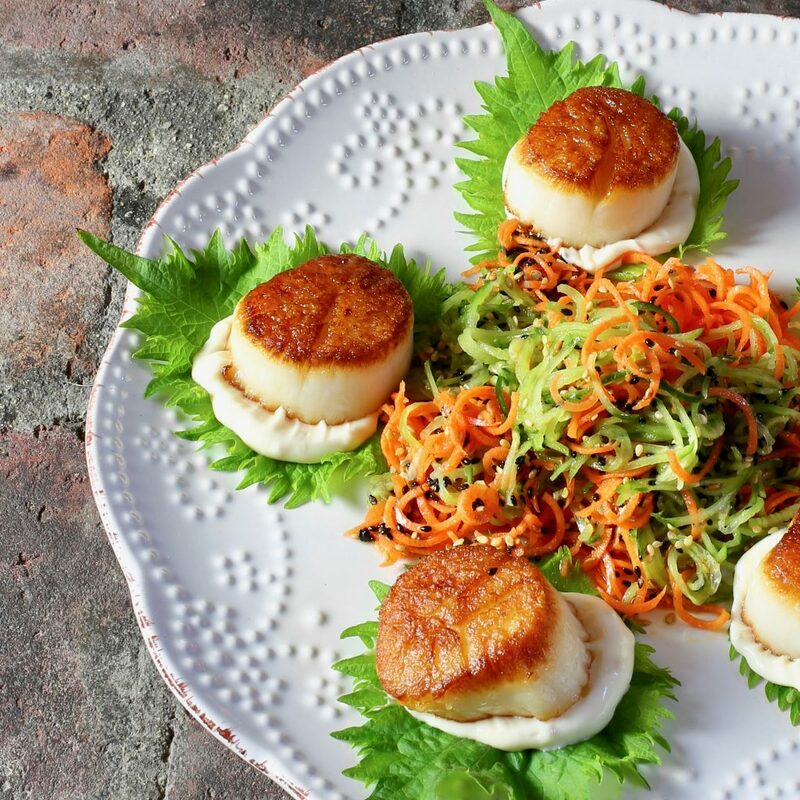 To preserve the caramelized crust on the scallops, top with a spoonful of carrot cucumber slaw just before serving one scallop to each guest.